It is well known that each reactor core is surrounded by a neutron reflector or reactor core baffle. The reflector reduces the non-uniformity of the power distribution in the peripheral fuel assemblies, reduces neutron leakage and reduces a coolant flow bypass of the core. The neutron reflector is a non-multiplying medium, whereas the reactor core is a multiplying medium. The neutron flux distribution is “flattened“, i.e., the ratio of the average flux to the maximum flux is increased. Therefore reflectors reduce the non-uniformity of the power distribution. Because of the higher flux at the edge of the core, there is much better utilization in the peripheral fuel assemblies. This fuel, in the outer regions of the core, now contributes much more to the total power production. The neutron reflector scatters back (or reflects) into the core many neutrons that would otherwise escape. 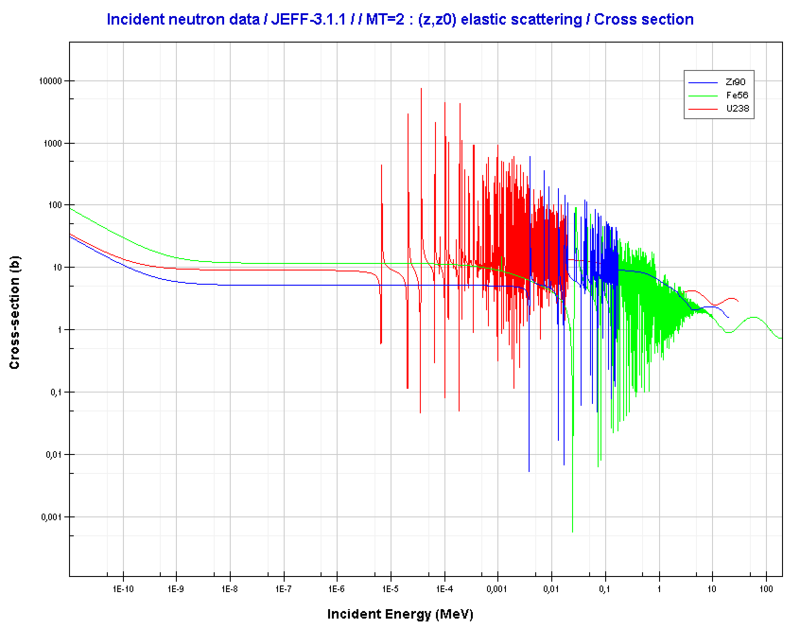 The neutrons reflected back into the core are available for chain reaction. This means that the minimum critical size of the reactor is reduced. Alternatively, if the core size is maintained, the reflector makes additional reactivity available for higher fuel burnup. The decrease in the critical size of core required is known as the reflector savings. 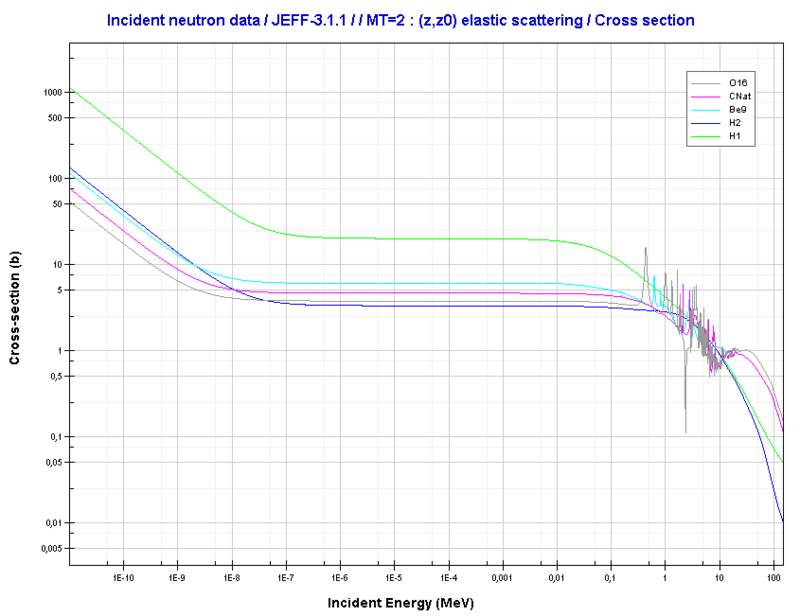 Neutron reflectors reduce neutron leakage i.e. to reduce the neutron fluence on a reactor pressure vessel. Neutron reflectors reduce a coolant flow bypass of a core. Neutron reflectors serve as a thermal and radiation shield of a reactor core. 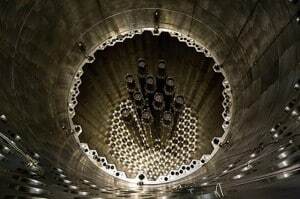 Neutron reflector inside a reactor core of LWR. It is only an illustrative example. where Drefl is the diffusion coefficient in the reflector and the Lrefl is the diffusion length in the reflector. 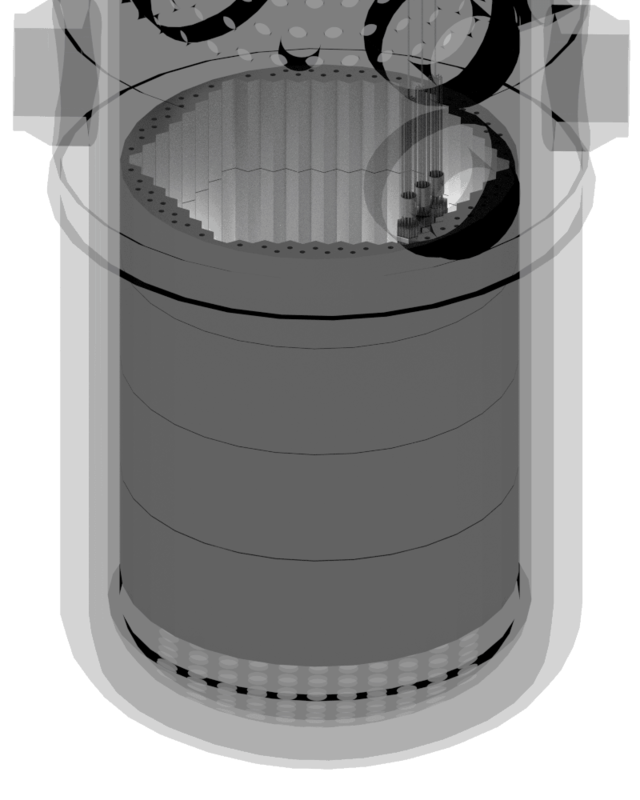 Top view of the WWER-1000 nuclear core. The lower support structure, the neutron reflector and 11 fuel assemblies. 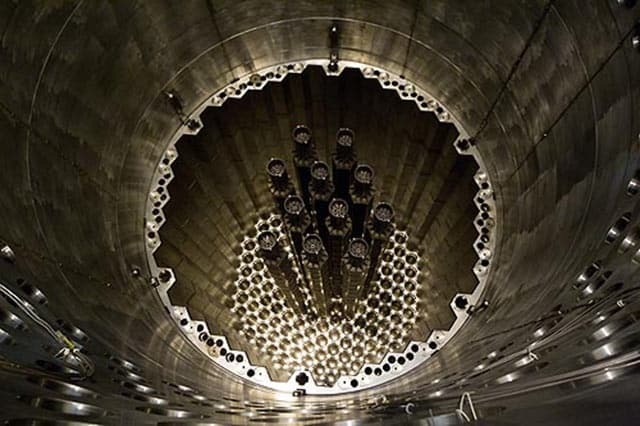 There are a variety of materials which are used as a reflecting medium for neutrons in nuclear reactors. In general, reflector materials are normally not fissionable, have a high scattering cross section, and have a low absorption cross section. Since main differences among reactor types arise from differences in their neutron energy spectra, we have to specify whether we mean reflectors in fast reactors or in thermal reactors. Since the moderation of neutrons is undesirable in fast reactors, they use only high Z materials. To be an effective reflector, its material must possess the following properties. Resistance to Oxidation – The reflector is often situated in a chemically aggressive environment (especially in fast reactors), therefore the material should not get oxidized. For intermediate and heavy elements, the elastic cross-section is constant at low energy with some specifics at higher energy. Essentially, for thermal reactors a good moderator is also a good reflector, because most of the moderators also possess the above mentioned properties of a good reflector as well. Water, heavy water, beryllium, or graphite are commonly used as reflectors. In pressurized water reactors water serves as an axial reflector. This axial reflector does not form any special device, the neutrons are simply reflected by core inlet and outlet coolant. Core Baffle. 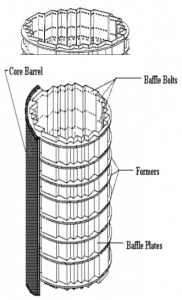 Core baffle consists of baffle and former assembly that consist of vertical plates called baffles and horizontal support plates called formers.This assembly forms the interface between the core and the core barrel and there is water between the baffle and the core barrel. Since the coolant flow in the former region is significantly reduced by the former, the high flow rate through fuel assemblies is maintained. A secondary benefit is that water in the former region reduces the neutron flux on the pressure vessel, which causes an irradiation embrittlement of pressure vessel material. Visualisation of a heavy reflector. It is only an illustrative example. Heavy Reflector. 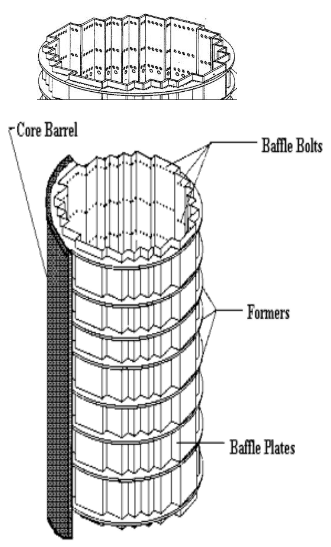 Heavy reflector is a structure that is installed inside a core barrel (similarly as a core baffle). But the heavy reflector is a wall made of stainless steel slabs stacked vertically surrounding the reactor core. Due to higher atomic number density heavy reflectors reduce neutron leakage (especially of fast neutrons) from the core more efficiently than core baffle. This provides additional protection of the reactor vessel from irradiation embrittlement, caused especially by fast neutrons. While acting as a neutron shield, the heavy reflector is heated due to absorption of the gamma radiation. In order to avoid overheating, the heat in the reflector is removed by water flowing through cooling channels drilled through the reflector. In fast reactors moderation of neutrons is undesirable, therefore reflectors are not composed of moderating materials. In fast breeder reactors the core is surrounded by a radial core reflector. The radial core reflector is usually composed of fuel assemblies with natural uranium (so called the radial blanket zone), for which the diffusion coefficient is about the same as that of the core. This reflector improves the radial flux distribution, reduces the fissile inventory, and increases the internal breeding ratio.